(Note) The maximum operation distance stands for the maximum distance for which the sensor can detect the standard sensing object. 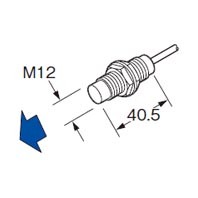 The stable sensing range stands for the sensing range for which the sensor can stably detect the standard sensing object even if there is an ambient temperature drift and/or supply voltage fluctuation. Voltage withstandability 1,000 V AC for one min. Weight Net weight: 65 g approx. Accessories Nut: 2 pcs., Toothed lock washer: 1 pc.